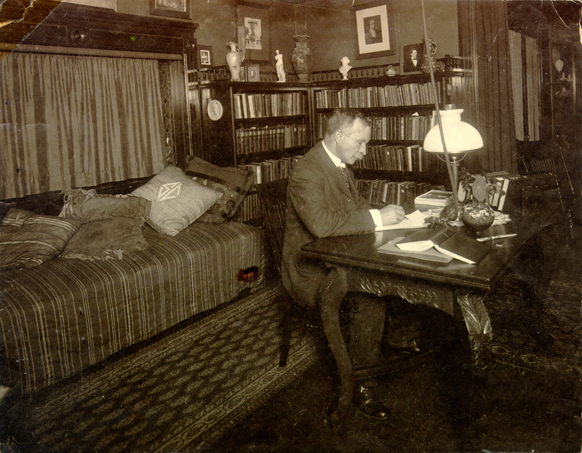 Charles W. Chesnutt writing at the desk in the library of his home at 9719 Lamont Avenue, circa 1905. Image courtesy of the Cleveland Public Library Digital Gallery. 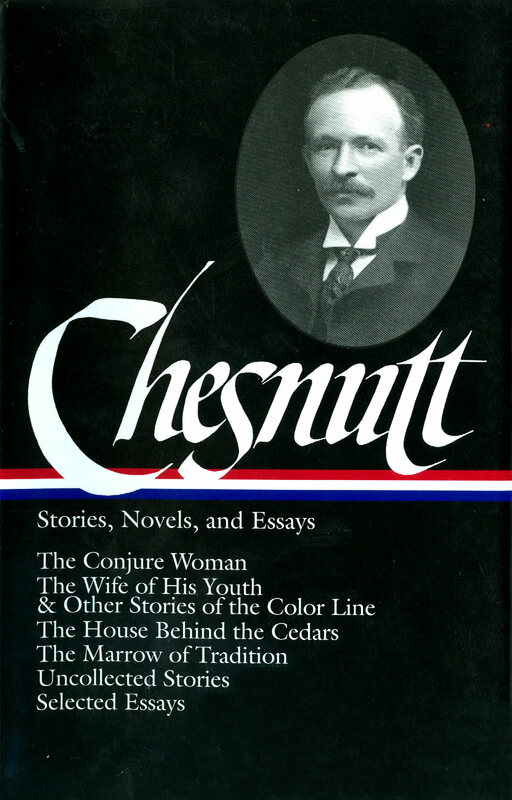 Two of Chesnutt’s targets, often enough, were snobbishness and hypocrisy, whether found in white society (see “Baxter’s Procrustes”) or black (as in one of his best-known stories, “The Wife of His Youth”). In the satirical “A Matter of Principle,” he introduces Cicero Clayton, a stalwart member of the Blue Vein Society, a fictional social organization that made its original appearance in “The Wife of His Youth.” The Blue Veins were almost certainly modeled on the Cleveland Social Circle, an elite social club for “better-educated people of color” that Chesnutt himself had joined a decade before he wrote the stories. Readers might notice an anachronism in the story. The decade is identified as the 1870s, yet the characters have convenient access to telephones. The first telephone line was not installed in Cleveland until the summer of 1877, and according to The Encyclopedia of Cleveland History “telephone service in Cleveland properly begins with the first telephone exchange, opened 15 Sept. 1879 by the Western Union Telegraph Co.” The Cleveland Telephone Company was not established until January 1880; even a decade later, barely 1% of Cleveland’s residents had phone service. “What our country needs most in its treatment of the race problem,” observed Mr. Cicero Clayton at one of the monthly meetings of the Blue Vein Society, of which he was a prominent member, “is a clearer conception of the brotherhood of man.” . . . If you don't see the full selection below, click here (PDF) or click here (Google Docs) to read it—free!